The ASAQS Wits Student Chapter hosted their 3rd annual Women’s Spring Breakfast (formerly known as the Women in Construction High Tea) this past Saturday with a variety of powerful women in the construction and built environment. The event has always highlighted transformation initiatives which aim to advance the engagement of female students with female professionals through engagements, dialogue and debates. The theme this year was “Laying the Foundation”. For the first time in its history, the Women’s Spring Breakfast was open to men in the industry and some of our male student members for a more inclusive talk, understanding the positions that men are in and how they can change issues that affect women in the workplace. One of our keynote speakers, Lungisa Sishuba, a Commercial Manager at Inkanyeli spoke of understanding how male privilege hinders the advancement of women in the professional space. Miranda Baloyi, PrQS, entrepreneur and 3rd year lecturer at Wits School of Construction Economics and Management, kicked off the programme with the theme of “Laying the Foundation” of empowerment and entrepreneurship by sharing her raw experiences of being a business owner. The ladies in the panel discussions consisted of Fundi Mazibuko, Head of Marketing and Business Development at Fullserve, who emphasized the importance of presenting yourself well and being authentic. Thobile Nyawo, Founder of Nyawo Construction spoke about perseverance as the key to success and the importance of networking. 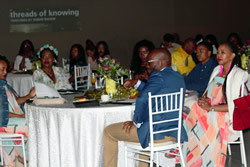 Pride Ndlovu, Senior Lecturer at Wits School of Construction Economics and Management reiterated the note of networking from a university level as those connections may help in the outside world. She also told our audience about accepting challenges and not letting them deter anyone. We would like to thank all our keynote speakers and panelists for reserving their time to come and share the day with us. A big thank you to Bongiwe, the Origins Centre Manager for getting the venue ready for us, and Jolene, Manager at Café Fino, for her catering services and décor. As we close of the year, ASAQS Wits Student Chapter would like to thank all their members for the continued support. Thank you to the ASAQS executive and subcommittees for their hard work, dedication and investment they have made into the chapter. We wish the outgoing leadership happiness and success in their careers and may the new incoming team take the chapter to new heights.